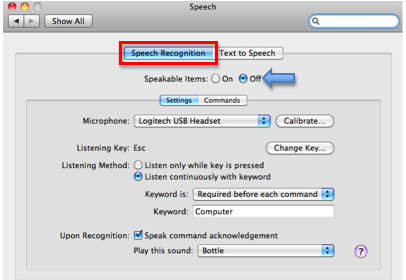 The Speech Recognition feature in Mac OS X can be used to control the computer with your voice. In the Speech Recognition pane, select the On button next to Speakable Items. Use the Microphone menu to select your microphone. 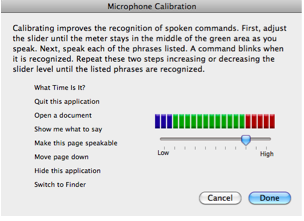 Clicking on Calibrate will open a window where you can use the slider to adjust the microphone input level. The default listening key is the Escape key. Click on Change Key to use a different listening key. When the popup window opens, press the desired listening key(s) and click on OK. Choose a listening method. The options are to use the listening key you set up in Step 4 or to speak a phrase such as “Computer” before each command. Check the box next to “Speak command acknowledgement” to have the computer play a sound when a command is recognized. Use the menu to select the sound. 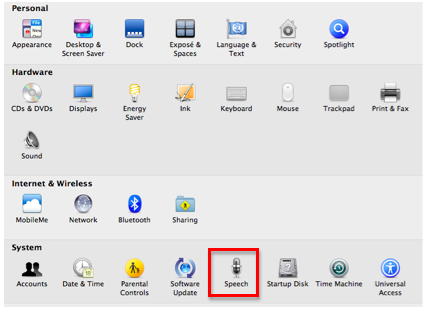 When the Speech Recognition feature is active you will see a speech recognition control on your desktop. To issue a command, hold down the listening key while you speak the command, or say your keyword followed by the desired command.